The first 20 minutes of an engine's life are crucial so that the engine can sustain a long life. 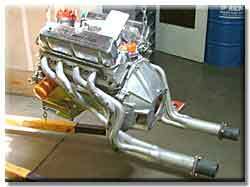 Initial start-up of any engine is very crucial. FE Specialties incorporates an engine run-in stand so that we can precisely break in new flat tappet cams, monitor engine oil pressure, water temperature, and check for any leaks that might occur. The first 20 minutes of an engines life are crucial so that the engine can sustain a long life. If a cam goes flat due to improper break in, it can cost almost as much to fix as the initial rebuild. Cam debris goes everywhere in the motor, scuffing pistons, rings, tearing up the oil pump rotors, and scuffing the cylinder bores. 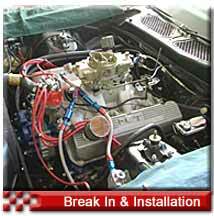 For a nominal fee, we take the danger and guess work out of the break-in process on any engine, and insure the proper break-in and longevity of each motor. We also have a full service installation shop. We can R&R any motor, from just about any car. We also can detail engine compartments, rewire and reloom the electrical connections and circuits. We take pride in making sure that we protect every surface of the car during the installation process. Cars are kept under car covers during idle times between processes.